(BPT) - Do you have a small patio? Do you think you can't do much with the space due to its size? There's probably a lot more potential than you think. From the influx of urban dwellers, empty-nesters in transition and even the tiny-home movement, the trend of downsizing continues across the United States. Contrary to popular belief, you can have an impressive patio even if you have a smaller abode. Add visual interest under foot with a patterned rug. A rug properly placed under a table can break up a smaller floor, giving the illusion of more square footage. Colored rugs are readily available in a variety of designs. Pick your favorite striped, chevron or paisley variety and see what a difference it makes. The natural elegance, gentle gurgle and sparkle of a flowing water feature can add a sense of peacefulness to any patio. 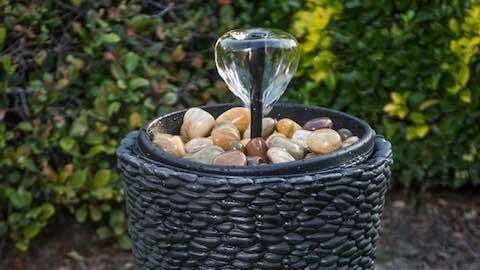 For smaller spaces, easily turn a decorative waterproof container or planter into a beckoning water feature by simply adding water and a smartpond Low Water Shut-off Fountain Pump. This smart pump automatically shuts off if the water becomes too low, preventing pump burnout. It's also a great replacement pump option to revive a decorative premade fountain that has quit working. Learn more at www.smart-pond.com. To get the most out of a limited space, think upward instead of outward. Hanging plants are a classic option, but vertical wall gardens are a top trend that's sure to be a conversation starter. You'll enjoy plenty of greenery but also open floor space for your furniture, water feature and entertaining to ensure a welcoming area for hosting summer parties. To get the most out of every inch of your petite patio, look for furniture and features that multitask to help save space while maximizing functionality. An easy solution is to opt for a table that opens to become a cooler for beverages or a bench to hold blankets and other patio extras. Just remember to keep scale in mind so you don't overwhelm your space with massive furniture. Matching is out for 2017, so forget about perfectly paired combos and explore a variety of decor. A great way to try this trend is to add visual interest by experimenting with different materials. Inject your own personality through various finishes. One example: consider setting black resin pots next to a handwoven wicker for an eclectic blend of textures. Don't make the mistake of thinking a small space must have muted colors. Vibrant hues inject energy and style, often making a small patio feel larger than it is in real life. From ocean blues to ferocious fuchsia, an accent pillow here and a throw blanket there will transform your space dramatically. From DIY water features to vertical gardens, a small patio doesn't have to be short on style or functionality. Let these top trends guide you to create a space you'll enjoy all year long. Home & Garden: "Big Ideas For Small Patios"